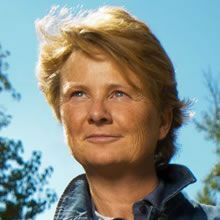 Janine Benyus is a biologist, innovation consultant, and author of six books, including Biomimicry: Innovation Inspired by Nature. In 1998, Janine co-founded Biomimicry Guild, the world’s first bio-inspired consultancy, bringing nature’s sustainable designs to hundreds of international product brands. In 2006, Janine co-founded Biomimicry Institute, home of AskNAture, an online library of life’s best ideas. In 2011, she launched Biomimicry Professionals. Janine’s awards include the 2011 Heinz Award, UN 2009 Champion of the Earth, and TIME International 2007 Hero of the Environment. Learn more about Janine at biomimicry.net or janinebenyus.com.